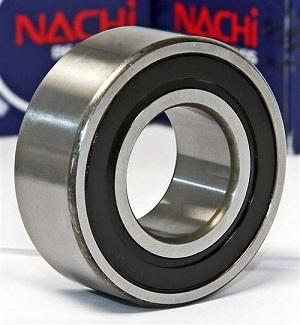 Double Row Ball Bearing Japanese NSK, NTN, KOYO, NACHI Double row deep groove ball bearings correspond in design to single row deep groove ball bearings. Their deep, uninterrupted raceway grooves have a close osculation with the balls, enabling the bearings to accommodate radial loads and axial loads in both directions. Double row deep groove ball bearings are very suitable for bearing arrangements where the load carrying capacity of a single row bearing is inadequate. For the same bore and outside diameter, double row bearings are slightly wider than single row bearings in the 62 and 63 series, but have a considerably higher load carrying capacity. Double row deep groove ball bearings are only available as open bearings (without seals or shields). If you don't see your sizes please contact us.